When I learned about the Delphi Salaried Retirees Pension Scandal in a brief news item on Bankruptcy Law Review, I started wondering if members of the Obama Administration and other insiders were meddling with the bankruptcy courts to deliberately transform the bankruptcy process into a mechanism for the redistribution of wealth. My interest grew further when I interviewed Alex Cortes of Let Freedom Ring, who has been following this issue, and learned that many of the affected retirees lived in Ohio, a critical swing state for this upcoming presidential election. I contacted Ohio Congressman Mike Turner from Dayton, Ohio, to ask him to share his observations about this abuse of the bankruptcy legal process and how it affects retirees who live in his district. Congressman Turner agreed to go on-camera with TexasGOPVote and provided the best information I have received so far about how a lawless Obama Administration is perverting the bankruptcy process to affect wealth redistribution. In a normal bankruptcy process, the Pension Benefit Guarantee Board is tasked with looking for equity and balance in the distribution of a bankrupt company's assets. In this case, according to Turner, "The White House intervened in this process, and in doing so, reduced the pensions of the salaried retirees while they fully "upped", or made whole, the pensions of the UAW workers." Essentially, the union workers were receiving a political payback from the Obama Administration. Turner addressed this stating, "Well certainly politics plays a role. There's also an issue of the financial dealings between the parties with the auto task force and their own financial interests, but in the end, what we see is there are individuals, who by contract, were guaranteed pensions, and in the process of the auto bailout, their pensions were reduced. The taxpayers ended up owning General Motors and union UAW workers had their pensions fully restored. That type of inequity, where people were working together at the same company for years and have this disparity in outcome is just wrong." What has happened to the Delphi salaried workers is an outrage by any standard. Imagine if this blatant discrimination by the Obama Administration was done on the basis of something other than union membership. Would it be acceptable if they terminated the gay retirees' pensions while leaving the heterosexual retirees' pensions whole? Or how about if they terminated the Jewish retirees' pensions while leaving the Christians' pensions whole? Of course not! So why is this government sanctioned discrimination, executed under the guise of a "bankruptcy court proceeding", being allowed to stand? Was anybody even watching this process? The Bankruptcy Court of the Southern District of New York has allowed the Obama Administration to sit on all sides of the table in this shameful bankruptcy proceeding. Was there any supervision in this court to insure an equitable legal process? Turner explains how the process is supposed to work versus what actually happened: "Generally, when you see a bankruptcy, you'll have the PBGC, you'll have the bankrupt entity, you'll have the creditors, and PBGC is supposed to stand in the shoes of those who have pensions to ensure that their interests as a creditor in the bankruptcy are honored and made whole. In this instance, because Treasury was in effect buying the bankrupt and Tim Geithner is on the board of the PBGC and their connections with the United Auto Workers and then also through TARP, many of the bond holders or lien holders were financial institutions that were subject to Treasury's pressure. You ended up having a deal that Tim Geithner got to structure because he was on all sides of the transaction, there was no balance of the varied interests. So you see, the pension guarantee board then, having their authority weakened as Geithner exercised the decision making." I summarized this by saying, "...so you've got four guys sitting at the table and they're all named Tim Geithner...", to which Turner replied, "Exactly!". Turner went on to comment about the speed with which the GM bankruptcy took place (44 days). This is where the Delphi retirees got thrown under the bus. Turner said, "I'm certain the bankruptcy court wasn't prepared for the federal government to come into the court and basically be sitting in all seats bringing forth what they proposed as an equitable deal that was not." The PBGC is the only organization with the authority to reduce or eliminate pensions. The Treasury Department circumvented this process by uninviting PBGC regulators from the meeting discussing the Delphi pensions. Turner said, "The PBGC is supposed to be the fiduciary, standing in the shoes of the pensioners and protecting them, and we clearly see from the emails that we've made the Administration release, and they're still resisting releasing both the documents for the litigation and as part of the Congressional investigation. But the ones that we've seen show that clearly they were pushed aside. The Treasury and the auto task force ran this and they did so to the damage of these retirees." "Well, we're pursuing both paths. The salaried retirees are suing, and at the same time, we're doing a Congressional Investigation... and our investigation is to try and discover, what happened, how these decisions were made, what laws, if any, were violated... and similarly the litigation is trying to do that." In the complaint filed by the Delphi Salaried Retiree Association (Black et al v. Pension Benefit Guaranty Corporation), filed in October of 2009, the plaintiffs asserted that their benefits from the Delphi Retirement Program for Salaried Employees were unlawfully terminated by the PBGC in violation of the Due Process Clause and the Employee Retirement Income Security Act of 1974 ("ERISA"). Congressman Turner and the House Oversight Committee have done an outstanding job standing up for the Delphi salaried retirees and shining the light of truth on this abusive bankruptcy process. The committee held a hearing on July 10 titled "The Administration’s Auto Bailouts and the Delphi Pension Decisions: Who Picked the Winners and Losers?" (video). We will dive deeper into this interview, the progress of the litigation, the Oversight Committee hearings and the progress of the congressional investigation in future articles. Bob Price: We're going to take a little trip outside Texas here and actually meet with Ohio Congressman Mike Turner from the Dayton, Ohio area. One of the issues that we are very concerned about and that we've been talking about is the issue of the Delphi salaried retirees actually losing their pension benefits, and I know you've been working very closely with them trying to get those restored. Can you explain just a little bit to our viewers who might not be up to speed on this issue why it's so important and how it's impacting your constituents in particular. Congressman Mike Turner: Yes, well thank you for bringing attention to this issue because it's one that has not gotten enough discussion that I think is a complete and total injustice that actually came out of the auto bailout. The President, as you know, had appinted an auto task force within the Department of Treasury as they moved forward with what really was in effect the acquisition of General Motors. General Motors went though bankruptcy, and its former subsidiary, Delphi, was also going through the bankruptcy process, and there were a lot of agreements between the two companies that affected retirees and their benefits. As the two companies were proceeding, the administration made a decision as to whose pensions would be restored and whose pensions would be reduced. Generally people would think that if they retired from a company, they'd all be treated equally, and generally, they usually are. In a bankruptcy proceeding, a pension guarantee board under the United States backing of pensions looks for equity and balance, but the White House intervened in this process, and in doing so, reduced the pensions of the salaried retirees while they fully upped, or made whole, the pensions for the UAW workers. Congressman Turner: Well certainly politics plays a role. There's also an issue of the financial dealings between the parties with the auto task force and their own financial interests, but in the end, what we see is there are individuals, who by contract, were guaranteed pensions, and in the process of the auto bailout, their pensions were reduced. The taxpayers ended up owning General Motors and union UAW workers had their pensions fully restored. That type of inequity, where people were working together at the same company for years and have this disparity in outcome is just wrong. Bob Price: I understand that the PBGC is basically the only agency with authority to make the decision to revoke a pension or suspend pensions or anything like that, but in this case, they were actually uninvited from meetings that were being held by the Treasury Secretary Mr. Geithner and excluded from that process. Congressman Turner: Generally, when you see a bankruptcy, you'll have the PBGC, you'll have the bankrupt entity, you'll have the creditors, and PBGC is supposed to stand in the shoes of those who have pensions to ensure that their interests as a creditor in the bankruptcy are honored and made whole. In this instance, because Treasury was in effect buying the bankrupt and Tim Geithner is on the board of the PBGC and their connections with the United Auto Workers and then also through TARP, many of the bond holders or lien holders were financial institutions that were subject to Treasury's pressure. You ended up having a deal that Tim Geithner had to structure because he was on all sides of the transaction, there was no balance of the varied interests. So you see, the pension guarantee board then, having their authority weakened as Geithner exercised the decision making. Bob Price: So basically, you've got four guys sitting in the room and they're all named Tim Geithner. Bob Price: That's just insane. Now, the bankruptcy courts generally are supposed to provide adult supervision to make sure all parties are protected. How does that get by without supervision in that area. Congressman Tuner: You know, this is all part of a lawsuit where the salaried retirees have now sued and said that that entire process was a miscarriage of justice, and I believe that it is, and I believe that they should win that lawsuit. But this was a very unusual judicial process, and I'm certain the bankruptcy court wasn't prepared for the federal government to come into the court and basically be sitting in all seats bringing forth what they proposed as an equitable deal that was not. Bob Price: I understand that the Delphi bankruptcy had been dragged out for many years, whereas the GM bankruptcy was shut through in 44 days, and I guess in the process of all of that speed, the process gets lost in the rush. Congressman Turner: That's right. There's not as much oversight when people are rushing to do something. Bob Price: I understand the discrepancy as to where the money actually is. Was it the PBGC that said that the pension fund was actually underfunded, and that's why they were taking it, and the reality is that it was actually funded enough to actually take care of the pensioners for many generations. 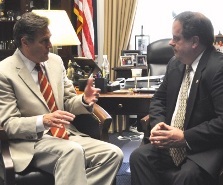 Congressman Turner: Yeah, that's the dispute that the salaried retirees were middle management in this company, they were running the company and these programs, when they look at the documents and the financials, they say that the Delphi and their pensions were completely misrepresented through the bankruptcy process, but in fact, their pension had been funded sufficiently, and it was entitled to liens on assets, many foreign assets that General Motors and Delphi had been expanding into, that would have also been sufficient, but those liens were waived to the benefit, obviously, of some of the creditors and the ultimate owners, the taxpayers and the UAW. So, there clearly is a sense that they're backdoor deals that are being done. Bob Price: I have been writing a series entitled "The Lawless Presidency", and this morning we heard the Judiciary Committee hearing on that very topic, it was very interesting, but this whole issue with Secretary Geithner basically playing all sides and these Delphi retirees not having any representation in the process, I think that's a clear example of this. Congressman Turner: It's absolutely wrong. The PBGC is supposed to be the fiduciary, standing in the shoes of the pensioners and protecting them, and we clearly see from the emails that we've made the Administration release, and they're still resisting releasing both the documents for the litigation and as part of the Congressional investigation. But the ones that we've seen show that clearly they were pushed aside. The Treasury and the auto task force ran this and they did so to the damage of these retirees. Bob Price: That really is amazing... you don't think that something like that can happen in America... there's equal protection under the 14th ammendment, it just doesn't seem like this sort of thing could happen, and yet it does. Is this just the tip of the iceberg, or are there other cases out there? I have heard of cases where shareholders are being sued in bankruptcy cases through the process of litigation trusts, for doing nothing wrong other than just buying stock on the stock market... are we in danger of our stock investment system being corrupted because of this? Congressman Turner: Well I think the moment that the Government, through TARP, stepped in to..., our, financial institutions, basically into Wall Street, you subvert the system. The decision-making is no longer just, law and business decisions... you have political decisions that we saw with Delphi Salaried Retirees... you have the possibility of corruption, where people will make decisions, exercising governmental authority, to their own benefit, financially, or to the benefit of their friends and... cronies, if you will. And that exercise of that influence is very evident with this administration and I think is of grave concern to the American people. Bob Price: ...in Congress, and you sit on the Oversight Committee, which is the committee that has actually been diving into this issue on behalf of the salaried retirees, and looking at the inequity of this, where do we go from this, is there a resolution through Congress or is it up to the courts to decide and make this whole... where does this go? Congressman Turner: Well, we're pursuing both paths. The salaried retirees are suing, and at the same time, we're doing a Congressional Investigation... and our investigation is to try and discover, what happened, how these decisions were made, what laws, if any, were violated... and similarly the litigation is trying to do that. They're also asking for documents that they are entitled to under judicial system, even though the administration is going to be resisting, so they can get a picture and at the same time we're doing the same. This bears congressional oversight, it bears congressional investigating... and the whole fact that the administration has tried to thwart the ability for anyone to know what happened, also should give everyone pause... because when they first did this, they said, we're going to do TARP, we're going to do the auto bailout, this is great, this is going to be great for America... if it's so great, then why won't they share the information about what they did? It's tax payer's dollars, this should be public, right? This is not Tim Geithner and President Obama's own little stock transaction, these are American dollars, these are tax payer dollars. Bob Price: That... that, is just amazing. Now I understand that Senator Brown from Ohio has come up with a solution to this that involves tax payers spending more money. That's not surprising, I guess, coming from that side of the aisle, but is it necessary for tax payers to spend more money to fix this problem? 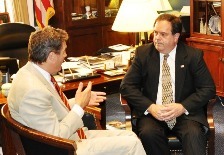 Is Senator Brown kind of off in left wing on this? Congressman Turner: Well, his particular bill certainly has a problem. One is that it is obviously born of the political environment that we are in, we are 60 days out from an election, so he draws up a bill that clearly is not going to move anywhere in the Senate... but, the Delphi Salaried Retirees believe that they have a solution to this that would not result in [spending] additional tax payer dollars, and that would completely satisfy their pensions and their pension obligations. Senator Brown's bill is about selling General Motors stock at a value that it's never, in the immediate future, is going to reach. It's an accounting transaction that actually results in zero dollars for the retirees. Bob Price: This wouldn't be the first time that the Democrats have put forth a bill, with no intention of passing it, just to make themselves look good. Congressman, we appreciate your time and the effort you're putting into this. Is there anything else that you'd like to say on this issue and can we count on you to follow up with us on where this goes from here? Congressman Turner: Absolutely, what I'd like to do is this, first of all, thank you again for making this an issue other people can become aware of, because through bringing attention to this, you know, the injustice that has occurred, we both can address it, but also, we hold this administration accountable for how they're subverting our system. Bob Price: Well thank you again, we appreciate it and look forward to hearing for a solution to this issue that makes these people whole, and maybe we can just get rid of that lawless administration at the same time. Thank you for your time. Congressman Turner: Thank you so much.